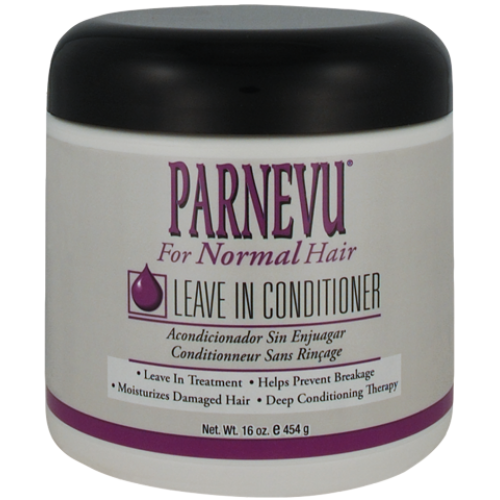 PARNEVU Leave-In Conditioner for Normal Hair (also available for Extra Dry Hair) is uniquely formulated to prevent split ends, hair breakage, dry scalp, and brittleness. It repairs, conditions, and leaves hair healthy, vibrant, and strong. When used daily, it helps bring your hair back to its natural balance. 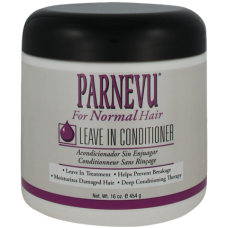 This leave-in treatment is a light, easily absorbed formula that is an excellent daily treatment for relaxed, permed, tinted, dyed, and chemically-treated hair. Use after every shampoo for continuing protection against split ends or dry, brittle hair. INGREDIENTS: Water (Aqua, Eau), Mineral Oil (Paraffinum Liquidum, Huile minerale), Petrolatum, Cetearyl Alcohol, Polysorbate 60, Cyclopentasiloxane, Dimethicone PEG-8 Meadowfoamate, Acrylates/C10-30 Alkyl Acrylate Crosspolymer, Aloe Barbadensis Leaf Juice, Benzophenone-4, Hydrolyzed Wheat Gluten, Triethanolamine, Phenoxyethanol, Methlparaben, DMDM Hydantoin, Fragrance (Parfum), Blue 1 (CI 42090), Red 33 (CI17200).